Bahrain's arrest on Sunday of al-Wifaq leader Sh. 'Ali Salman, ostensibly in response to recent "escalatory" statements, has, at least according to the New York Times, left many observers "puzzled." Indeed, the newspaper quotes no less than Khalil al-Marzuq as saying that "despite the government’s history, he was surprised by the arrest. 'Why should they create more trouble with this move? '," he asked. Among this "trouble" is not only the reaction by al-Wifaq supporters, but, more importantly from the Bahriani government's standpoint, that of the international community. The UN high commissioner for human rights, who is hilariously somehow a member of the Jordanian royal family, delivered a pointed rebuke following the announcement of Salman's arrest, while the United States is as usual "deeply concerned." Yet the State Department statement fell far short of calling for his release, saying only, "We strongly urge the Government of Bahrain to follow due process in this and all cases." So, basically the U.S. government is calling on Bahrain to conduct the fairest and most transparent sham trial possible. However, one could perhaps more easily make the opposite argument: that, precisely in light of the state's observed political tactics since the uprising, this move is little surprising if not altogether inevitable. Officially, Bahrain's attorney general accuses Sh. 'Ali of delivering "statements [that] had significantly escalated from incitement and hate speech ... to threats of military force against the state, including the imminent option to deploy methods currently used by armed groups operating elsewhere in the region." Apparently, then, Sh. 'Ali let slip al-Wifaq's secret plans for a Huthi-style blitzkrieg invasion and takeover of Manama and al-Riffa, the tribal seat and present de facto capital of Bahrain. Of course, one doubts whether 'Ali Salman's statements and sermons over the past week or month differ qualitatively from those he's been giving since February 2011, if not before. As always, the occurrence and timing of the arrest stem from deliberate political calculations. In this case, multiple factors would seem to be in play. "You Need Us More Than We Need You"
As Khalil al-Marzuq is eventually made to mention in the New York Times story, Bahrain clearly feels emboldened to defy or annoy its Western allies at a time when it is playing a strategically significant political and military role (as a base of operations) in various conflicts throughout the region, including versus the Taliban in Afghanistan, Da'ish in Syria/Iraq, and to a lesser extent the Iranian regime. Just earlier this month Britain formally announced the signing of a deal to build a £15m permanent naval base at Mina Salman, while the U.S. is presently undergoing a significant expansion of its own Naval Support Activity Bahrain. At the regional level, Bahrain also will play host to a new joint GCC naval force announced at the Doha summit in December, and potentially a new GCC naval war college as well. Its regional and international partners thus in need of both its political will to join conflicts against Arab and Muslim enemies (mainly) of the West, as well as physical access to its strategically positioned territory, Bahrain can afford to thumb its nose at the United States and Europe for the sake (professedly) of its own "national security." Even before its electoral boycott, 'Ali Salman and al-Wifaq were under intense pressure, including formal legal investigation, by the Justice Ministry and other entities for their continued abstention from formal politics. If the group continues to eschew the parliament and elections and instead operate outside the normal channels of politics, the state argued, then how can it expect to remain a recognized or indeed tolerated political society? Now, with the election in November of yet another al-Wifaq-less parliament poised to remain for another four years, the government clearly recognizes the potential danger in having in effect two parallel political processes: one centered nominally around a formal, elected legislative body, and another involving dialogue and/or negotiations with an extra-parliamentary protest movement. Not only would such a dual-track further undermine whatever legitimacy the parliament enjoys, but it could also potentially rekindle the political hopes of those Sunni movements that abstained from or were defeated in the elections. Not incidentally, one presumes, just two days before his arrest 'Ali Salman was reelected as al-Wifaq Secretary General, promising for the state another four years of headache. By occupying al-Wifaq with the persecution of its leader, the state can ensure that al-Wifaq will voluntarily reject any notion of continuing the Crown Prince's National Dialogue process, and so also keep sidelined those Sunni groups (not to mention the Crown Prince himself) that have also been involved in the talks. However, more central to the state's decision-making here than all of the preceding, in my estimation, is its desire to dissipate or head off widespread Sunni resentment following the humiliation that was the November election. It was humiliating for Bahrain's Sunnis not only for the result -- the almost complete failure of Sunni groups to capture seats, in main part due to electoral engineering -- but also for the larger atmosphere surrounding the election. Sunnis, as characterized to me recently by one Bahraini, were compelled to vote by the ruling family like dogs made to sit. Many went to the polls in spite of themselves and having not even registered, passports in hand, in fear of the consequences threatened for those who condescended to stay home. The portrait drawn by many ordinary Sunnis is of a ruling family holed up in al-Riffa in their palaces and private airport, barely coming (with the exception of ever-busy Sh. Khalifa) to Manama or Muharraq, and watching as outsiders while the country continues to dissolve economically, socially, and politically. Yet, even those who hold this view remain nominal supporters of the state, loath to assist a Shi'a-dominated opposition by outward expressions of dissatisfaction. Thus, Bahraini Sunnis are left to stew in their frustration, caught between what is widely perceived as an uncaring government and an even more hateful opposition. Thus, as has happened so many times since 2011, when the state perceives discontent among its Sunni support base, it appeals to those more security-minded (as opposed to strictly reform-minded) among them by arresting or threatening to jail some or another opposition leader -- whether Nabeel Rajab, Khalil al-Marzuq, 'Ali Salman, or Sh. 'Isa Qasim himself. The sure-to-be drawn out legal process; the inevitable accusations of "foreign interference" in Bahrain's internal affairs; the wider crackdown on activists protesting 'Ali Salman's detention and eventual trial -- all offer no shortage of drama and distraction from substantive political issues. And, if all goes well, Bahrainis will forget all about the new parliament and government are or are not accomplishing. Update: We now know the specific "escalatory" remarks of 'Ali Salman that the general prosecutor refers to in his statement, and that are the nominal basis for his arrest. As seen in the below video (beginning around 1:38), Sh. 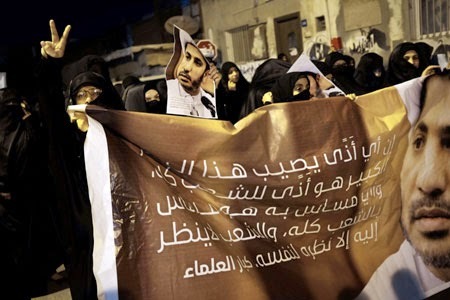 'Ali states that "the Bahraini opposition has been encouraged to become like the Syrian opposition and transform the country into a military battleground, but it has remained steadfast in its peaceful [protest]." This, as one can imagine, was not perceived by authorities in the same light as probably intended by Sh. 'Ali. One can hear the former asking suspiciously, "So, from whom exactly are you receiving encouragement and advice?!" "[Sh. 'Ali] confirmed that he had contacted a number of overseas regimes and political organisations to discuss the internal affairs of the Kingdom. These detailed discussions outlined Bahrain’s political situation and were aimed at achieving active interference in the internal affairs of the country and highlighted the willingness of a number of bodies approached to do so. The defendant did not inform any official authority in the Kingdom of these communications." Of course you could say that this whole business helps al Wefaq. The group's boycott of the parliamentary elections made it look faintly irrelevant politically. The main force behind that boycott was Ali Salman (against the wishes of many senior al Wefaq members). Ali Salman (who was re-elected unopposed as Wefaq Sec-General and is one of the longest serving opposition leaders in the world) has become, you might say, part of the problem rather than part of the solution. Are many in Wefaq breathing a sigh of relief at his arrest? Surely al-Wefaq has regained credibility because of this and has been granted a blessing in disguise.